‘Hustle, sweat and tears’ | What happens now? This week’s post is by DeQuincy Lezine, and if you think you’ve been advocating for attempt survivors for quite some time, get ready for a jolt. DeQuincy is the first director of the American Association of Suicidology‘s newly created Lived Experience division for people who’ve been suicidal and the people who love and support them. He also wrote the groundbreaking #WayForward national report that comes out in early July. It inspired the video above. More details coming soon. I got started as a first-year student in college, after my first suicide attempts, by contacting the Suicide Prevention Advocacy Network. I found no other attempt survivors in the national suicide prevention movement. That was 18 years ago. At the time, I worked alongside loss survivors. Since then, I graduated college and graduate school and postdoc, had a book published (Eight Stories Up) and have been involved in many national, state and local efforts. Some people have asked how to get “inside,” to be invited to make presentations or otherwise work with suicide prevention “professionals.” For example, “Do you need to have a degree before they will take you seriously?” No, but there are some things you can do that will help get folks to listen and work with you. Be specific: What do you want to change? What should it change to? Why? Who can make those changes happen? What really excited me was the idea of making bigger changes, even if they took longer. I was invited to join the national advocacy effort. With the Suicide Prevention Advocacy Network, we were told that if you go in to see a legislator or their staff, you need a specific request: sponsoring a bill, making a vote, participating in a hearing. It is never enough to tell somebody to simply stop something. When I was a clinician, I could see that simply telling somebody to stop a behavior like self-cutting or smoking cigarettes did not work in the long term. You need something better, something specific, to take the place of the behavior. Know your audience: What are their values and goals? What do they need to show others (e.g., funding agencies, boards of directors, department chairs)? It is easier to persuade a decision-maker when you know what he or she wants to achieve. As a clinician, I didn’t have time to spend on peer-reviewed articles about genetics and brain scans; I needed practical guidance that I could use to help my clients. On the other hand, as a research scientist, I might want those articles to support my own “statistically significant” results that could lead to publications and possible grants. My entire career would depend on that. As a patient in the emergency department, I think about the amount of waiting time before seeing a doctor. The hospital, on the other hand, pays close attention to “boarding times,” the amount of time a person spends in an emergency department bed before getting transferred or discharged. The patient thinks about what else he or she could be doing with that time. The hospital thinks about what else they could be doing with those resources. Both of those goals could be achieved through similar strategies. Look for common ground. If you can achieve your goal(s) without asking others to change theirs, or if you can offer benefits they care about for making the changes you want, then it’s much easier to get them on board. Early on, I could tell the level of acceptance and camaraderie that could be gained very quickly by speaking, or at least attempting to speak, another’s language. That was true when I was trying to learn and speak Spanish. As I became more familiar with terms from public health, prevention practices, mental health care and research around suicide, it was easier for me to convey my ideas to those professionals. It matches what I learned in cognitive psychology. Generally, the brain prefers to conserve energy. We would rather talk to somebody in the language we use every day. When we need to “translate” our normal speech, things slow down. I have seen this in pretty much every professional sphere I’ve been in. Be willing to learn: It helps to learn the key people, the key terms, the important histories and the values they share. I learned many lessons about advocacy from Jerry and Elsie Weyrauch, the founders of SPAN. I learned early lessons about mental health advocacy from Kay Jamison, while working toward the first national strategy for suicide prevention. I went to conferences and workshops. I completed gatekeeper training programs like QPR and ASIST. I skimmed or read through the major texts in suicide studies (e.g., Durkheim, Menninger, Shneidman, Joiner), and they are still on my bookshelf. I am a life-long student. Formal education doesn’t hurt, either. For some things, lived experience is enough, or might even be superior. For others, additional training and expertise is required. We do not yet have a clear or standardized way to match a certain level of lived experience with an equivalent level of academic training. Until then, having an academic degree helps you convey a certain amount of credibility and knowledge. However, advanced degrees are not always necessary. Quite a few of the very influential leaders in suicide prevention, particularly among loss survivors, have not had formal degrees, especially in mental health or public health disciplines. Show respect, earn respect, nurture relationships: I walked alongside loss survivors in Washington marches. I circulated flyers with suicide prevention advocates. I had lunches and dinners with the people founding or growing suicide prevention organizations. Yes, I got some respect for my ideas, but I also earned some with hustle, sweat and tears. Realistically, sometimes it really is about who you know. I served on committees, panels and task forces, gaining or strengthening professional relationships. I listened to people’s personal stories, their research interests, their clinical practices and the challenges they have faced. Those conversations have improved my understanding of others. I developed close relationships that have become powerful networking relationships over time. I am including a photo of the expert panel and additional advisers who helped lay the groundwork for the first national suicide prevention strategy. While others at the conference had dinner, went out for drinks and slept, we spent long hours working. That was a significant bonding experience. You can find me in the middle of the back row, as a college student representing attempt survivors, mental health “consumers” and youth. Others in the photo include former U.S. 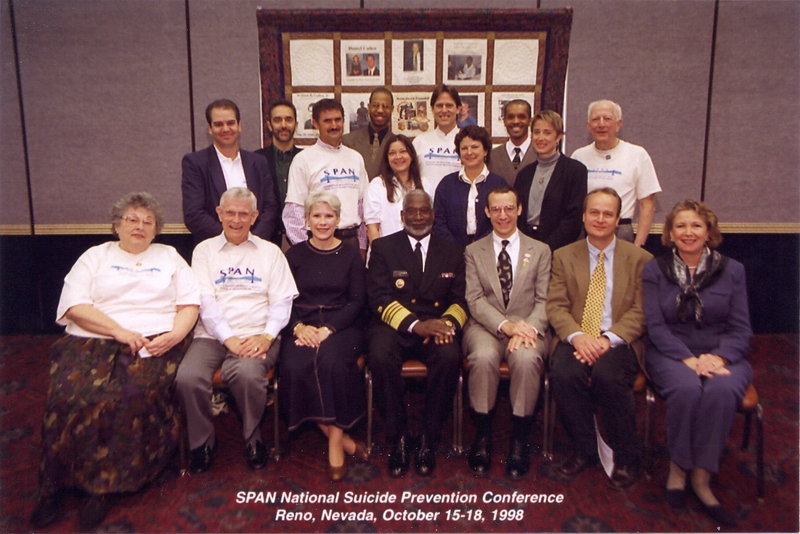 Surgeon General David Satcher, leading clinical researchers David Jobes and Mort Silverman, American Foundation for Suicide Prevention executive director Bob Gebbia, Alex Crosby with the Centers for Disease Control and Jane Pearson with the National Institute of Mental Health. I pretty much grew up as part of the national suicide prevention movement; it encompasses my entire adult life. Pay attention to timing: Almost all kinds of communication have a time and place, from shouting and debate to calm discussion or even silence. Some change requires immediate action. Some requires patience. I wish that suicide prevention could pick up momentum and just keep going. There have been periods that look like clear and steady movement, but over these 18 years I have seen starts and stops. It is progress, for sure, but it’s not smooth by any means. We got support from Congress and the U.S. surgeon general, but then it took three years after our conference to get a final version of the first national strategy for suicide prevention. A few years later, the field was re-energized with funding through the Garrett Lee Smith Memorial Act, followed by the Joshua Omvig bill. However, it took another few years to establish the National Action Alliance for Suicide Prevention, a public-private partnership that had been demanded for years. This is not intended to foster pessimism. Actually, quite the opposite. Keep going. Lulls are temporary. In times of great change, as it is now for the attempt survivor movement, there is a need for dynamic and bold approaches, a variety of them, big and small, to push the envelope and get as many things changed as possible. Perhaps this time around, the momentum will keep going. I hope so. For more between posts, follow us at @AboutSuicide. Thank you for the lesson on how to have a meaningful life and be successful at the same time. I will take to heart your insightful comments as I put together my post retirement life. This is what I’ve always wanted to do although I didn’t know it until a few months ago. Thank you for your time, your wisdom, your patience, your willingness to share. You are an example for all of us. We appreciate what you have done. Congratulations DeQuincy Lezine on seeing your hard work, dedication and commitment start to make changes. Great advice!